"Benefits of IoT Healthcare Applications"
Mobile apps are the most surgical contrary solution to the responsive website to meet your business needs. Mobile apps are developed specifically for a chosen platform or device, taking into account the particularities of each OS. The designs, codes, and best practices that suit, look, and work the best. Mobile apps offer robust and smoother, often giving a more cohesive user experience with the rest of the platform. Mobile apps get the best of the online and offline world as they are able to work on both and complement each other. Once the user’s downloaded the app from the app store and installed on the device, it doesn’t need an internet connection to function and display content. Also, there are many apps that need connectivity, that also allow a user to save data in offline mode to view it later, even without access to the internet. This makes your app within reach and lets your user view your content with simple taps, whether they have an internet connection or not. Mobile apps also solve the problem of loading times as there are fewer data to upload to the internet on the app’s flow. Mobile app helps the user to take the desired action right away when they want to, by allowing to add more complex navigation or content searching.Mobile apps are much lighter, much faster, and tend to provide a much better user experience than the responsive website. Mobile apps ensure the feasibility to include whatever functionality you want to enhance your sales with better services. Mobile apps don't have boundaries like the responsive site limitations with performance, navigation, page load speed and so on. 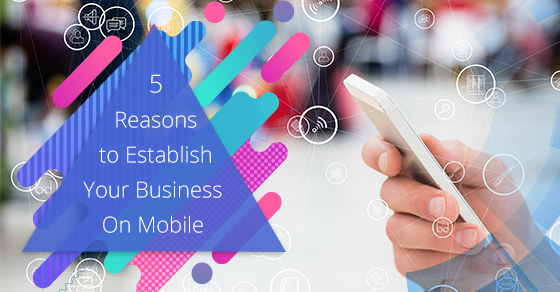 Mobile apps increase the services your business can offer through your app as it’s able to access all of the mobile device’s functions. Because the app is installed on it and works in conjunction with its various tools. Maintaining security at the highest level of priority will benefit your brand with users’ trust, once you lost that it is nearly strenuous to retrieve. Security can make or break your business as more and more user data is stored and handled by the companies. When users connect with a business through the Internet, they are exposed not only to its trackers but also to all the web.With the Mobile apps provides enhanced security to protect your user’s data without third party intervention which means users are less exposed. By building a Mobile app for your business could help you to improve your brand awareness just by promoting it and expanding your apps’ user base. With a Mobile app, you will never miss your audiences anymore, enhance it in app stores and promote on other channels, then remarket them via push notifications or monetize them with far more options. If you have a Mobile app you can raise the accessibility of your business, but the user will have to think of you once. Then, after the app has been downloaded, you will be on their screens and minds every time as they use their smartphone. Regardless whether you have a mobile application for your business or considering building a new Mobile application get in touch with us now! Let our expert developers help you grow your business.